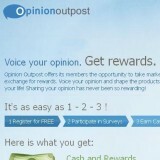 “Opinion Outpost Surveys”, found at opinionoutpost.com, is a marketing research and survey-taking company that has recently become part of Survey Sampling International (SSI) in which you can make a little money giving your opinions on products and services by filling out surveys. Joining “Opinion Outpost Surveys” is free, and you can be a resident of the United States or the U.K. if you’d like to become a panel member. Opinion Outpost has a points-based reward system in which you can get money put into your Paypal account when you reach their minimum payout amount. Note: Opinion Outpost Surveys no longer pays by check – as many review companies claim – as they have moved on to different payment methods after fraudulent companies began sending out checks purported to be from Opinion Outpost Surveys. Some of these fraudulent companies also contended Opinion Outpost was paying people to be secret shoppers, which is not true. Again, this is not a reflection on Opinion Outpost, as they themselves are a legitimate company. By taking Opinion Outpost surveys you accumulate points, and the basic point structure is 10 “points” for one dollar in the United States. You get more points for doing more surveys (and longer ones), and you must accumulate 50 points ($5) to get paid. It is said that “Opinion Outpost” surveys pay between 10-100 points each, but most are in the lower range. When you join Opinion Outpost Surveys, you will be asked to fill out numerous “profile surveys” which are not rewarded with points, but if you want to make money with them you should fill all of these out as you will have more opportunities to complete surveys that do pay if your profile is complete and up to date. Another very important thing to know is that you must remain active with ‘Opinion Outpost’ in order to receive points and therefor get paid. If you don’t at least attempt to qualify for a survey in a 3 month time frame, your account can and will likely be terminated – including any points you have built up to that point. The number of survey opportunities vary – as in any survey company – but it appears you could expect from 2-10 survey opportunities a month from Opinion Outpost. Again, that number could change – especially now that Opinion Outpost Surveys is under the SSI umbrella – but that’s a fairly common base number in the legitimate marketing research industry. There are also quarterly sweepstakes of differing amounts given away by Survey Sampling International, and your entry will be combined with entries from other panelists under the SSI umbrella in the U.S., U.K., Canada, and the Netherlands. Your entry competes with other entries from residents of your country. Some of those combined sweepstakes entries come from other SSI survey companies including but not limited to SurveySpot Research Panel, Opinion Outpost Research Panel, OpinionWorld Research Panel, Choozz Research Panel, and Your Voice Research Panel. The quarterly sweepstakes from “Opinion Outpost” plus other SSI-related companies in the U.S. pays $12,000. In Canada the sweepstakes amount is $1,500 in Canadian dollars. It’s different for each country, but each drawing is held four times a year. From my research it appears there are many people who consider Opinion Outpost Surveys to be one of the better survey companies, and many who are disappointed. This is not out of the ordinary, necessarily, but a factor in the wide variety of opinions from people who have joined could be in part due to the fact things have changed since they joined with Survey Sampling International. Also, many people are predisposed to being upset with being a panelist in a marketing research company when it turns out they don’t become wealthy from taking part in this business. You might have heard this before, but I’ll say it again: you will NOT become wealthy filling out surveys for any company! You will NOT earn $20 to $50 per survey completed! That just never happens! Opinion Outpost Surveys is a legitimate company, and appears to be a valid way to make a little money in the survey-taking arena… on par with most market research companies. Just don’t expect to make a lot of money completing surveys with Opinion Outpost Surveys… or ANY other get paid to complete surveys company. I do not recommend that you waste your time with paid surveys, in this case with Opinion Outpost Surveys. My account with Opinion Outpost was recently locked until I provided information to prove who I was…This seemed like a Phishing scam so I gave them only part of the information and explained that I didn’t feel comfortable giving all this info by email or over the phone and that I would gladly do it through their website . I was advised by emails ( which always came at 3 am) that I had to provide ALL the information to reactivate my account. They will not payout the balance owed me until I provide the info..( that they already should have on file)…so needless to say, I can’t recommend Opinion Outpost as I do not feel that my personal information is secure with them.